Oven-roasted tomatoes infuse salads, bruschetta, pasta and salsas with an intense, deep tomato flavor. Much of the water evaporates as the fruit cooks, which concentrates the flavor and makes for a denser texture. 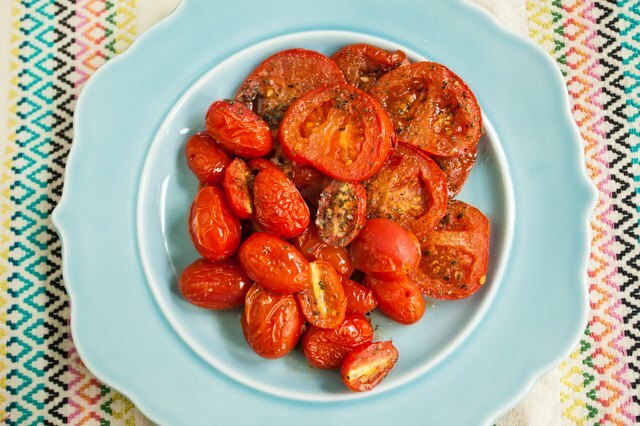 Freeze oven roasted tomatoes for months, or keep in the refrigerator for up to a month. Tomatoes that are at their peak are ideal for roasting, but those that are picked a little too early can also work. Oven roasting provides a way to preserve an abundance of tomatoes that you've acquired from your garden or a farmer's market. 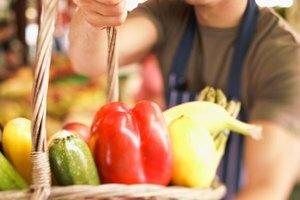 Beefsteak, plum, cherry and grape tomatoes are all varieties that benefit from roasting. 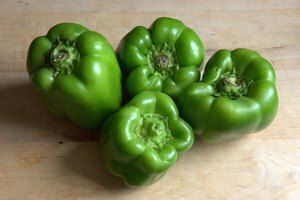 Set your oven to between 325 and 350 degrees F and slice the tomatoes in half or, for large specimens, into quarters. 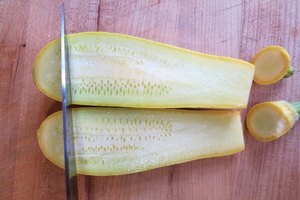 Prep rimmed baking sheets for the roasting process by pouring a tablespoon or two of olive oil onto the sheet and spreading it around evenly. Chop a few cloves of garlic and several tablespoons of fresh herbs, such as thyme or rosemary, and sprinkle them over the olive oil layer. Arrange the tomato halves on top of the oil, and drizzle them with additional olive oil and a bit of balsamic vinegar, an optional ingredient that adds sweetness. Sprinkle with salt and black pepper to taste. Roast in the preheated oven for 1 to 4 hours, depending on the size of the tomatoes. It's hard to overcook the tomatoes, but smaller cherry varieties will be ready much sooner than fatter beefsteak varieties. 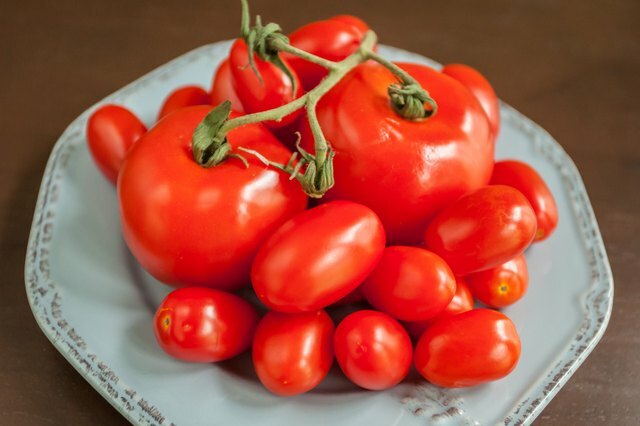 If you prefer your tomatoes skin free, allow the tomatoes to sit until cool to the touch and peel off the outer layer with your fingers while reserving the roasted pulp. The skin should slide off easily once the tomatoes are roasted. 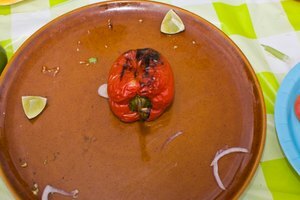 Broiling results in a charred, caramelized tomato that is suitable for fire-roasted salsas and pasta sauce. 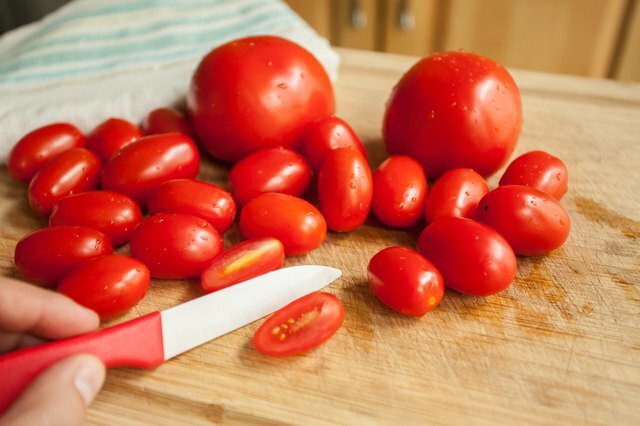 Use fresh, ripe tomatoes and slice them in half. Oil a baking sheet and place the tomato halves in one layer with the cut side facing down. Place the rack in your oven to the highest position and set the broiler to high. Once heated, slide the pan into the oven and broil for 5 to 10 minutes. Check every few minutes and move the pan around to foster even cooking. Once cool, slide the skins off if you choose, and blend the tomatoes into salsa or mash them into a pasta sauce. True fire-roasted tomatoes are done on the grill over high heat. If you choose to cook cherry or grape varieties this way, skewer them with a water-soaked bamboo stick or use a grill pan so they don't drop through the grates. Thick-skinned tomatoes, such as plum, are especially suited to the grilling process. Prep the grill so that the grate is just 4 inches from the heat and bring it up to high, for gas, or medium hot, for charcoal. You can grill whole tomatoes or cut larger ones in half to expedite the process. Place the tomatoes straight on the grill -- skin side down if halved -- and turn them with tongs every 3 to 5 minutes. You want blistered-looking skin for the smokiest of flavors. Occasionally, a whole tomato will burst as it cooks, but it will still taste delicious. The skins may split slightly, which indicates that the tomatoes are done. Depending on the size of your tomatoes, it will take between 5 and 20 minutes for them to roast thoroughly. 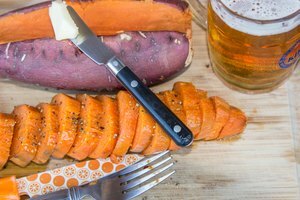 How Long to Bake Yams?